How to Remove Pigeons from a Building - Cute and kind of goofy, pigeons have a certain humorous appeal that makes use smile and tempts us to feed them bread and cracker crumbs. What most tourists don’t realize is that pigeons can be a large nuisance for home and business owners. If you are unfortunate to have a flock of pigeons roosting overhead, you know what I’m talking about. Pigeons, though seemingly awkward, unintelligent birds, are actually quite smart, as demonstrated in their ability to find their way home even if thousands of miles away. That’s right—thousands of miles. 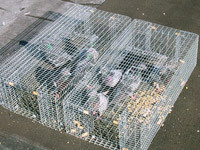 So, when it comes to pigeons, trapping and relocating is not an option. Roosting sites for pigeons are often loaded with piles of feces from the birds. 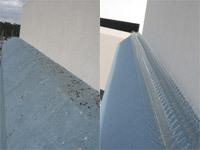 Despite being an eye sore, pigeon waste is very corrosive, and will damage most surfaces, even metal. If you don’t believe me about the pigeon waste, in the 16th century, it was a vital component in the production of gunpowder! Pigeons also relieve themselves frequently, as often as every five minutes. This waste elimination has more to do with proper body weight for flight than with diet. Corrosion is not the only issue with pigeon poop. Histoplasmosis is a serious illness transmitted to humans from pigeon waste. As the waste matter dries and becomes powder, the wind can easily transport it into the eyes and lungs of passersby. Various forms of histoplasmosis exist. Ocular Histoplasmosis, a fungal infection, causes the infected eyeball to waste away. Respiratory Histoplasmosis is associated with lung inflammation. No matter what form of histoplasmosis is present, many times the illness does not show symptoms. If untreated, the chances of fatality due to the disease are high. Salmonella and E.coli are also diseases that can be transmitted by pigeon waste. 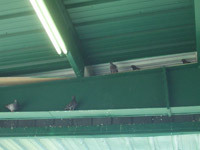 The best method to discourage pigeons from a home or business is to make the roosting site unfavorable to the birds. 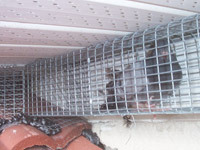 Special pigeon spikes, protruding points placed in target locations, can deter this avian. Electric strips emitting an intermittent pulse and topical, chemical agents that create a burning sensation can also be used to prevent a pigeon from landing on a specific area. Netting is useful in areas where it can be rigged appropriately. Scare tactic deterrents, such as owl figurines, rarely work to chase off pigeons. We rarely give animals enough credit in such circumstances. Just as we know something is not real, animals can also tell something is fake by the way it moves (or doesn’t move), the way it smells, and the way it appears visually. Fake owls will only serve as a testament to money wasted, and who wants a reminder of that? Pigeons can be a noisy, unsanitary problem. As a homeowner, if you have pigeons inside your home or attic, first locate where they are entering the building. After you have found that piece of the puzzle, call in a professional. Someone with experience will be able to advise you on what deterrents to buy, as well as recommend proper equipment to clean up the mess pigeons leave behind. It is not worth contracting a fatal illness just to say you removed the pigeons on your own. Too many considerations come into play to make pigeon removal a task that should be taken on alone. If you live in an area prone to these roosting birds, chances are there are a nice variety of professionals waiting to advise you.